"Eastern Orthodox Church" and "Orthodox Catholic Church" redirect here. For other uses of the term, see Orthodox. Pentecost: The spread of Christianity begins. The Orthodox Church, also officially called the Orthodox Catholic Church,[note 1] and commonly referred to in English-speaking countries as the Eastern Orthodox Church,[note 2] is the world's second largest Christian communion, estimated to number 300 Million  It is considered by its adherents to be the One, Holy, Catholic and Apostolic Church established by Jesus Christ and his Apostles almost 2,000 years ago. The Church is composed of several self-governing ecclesial bodies, each geographically and nationally distinct but theologically unified. Each self-governing (or autocephalous) body, often but not always encompassing a nation, is shepherded by a synod of bishops whose duty, among other things, is to preserve and teach the Apostolic and patristic traditions and related Church practices. As in the Roman Catholic Church, Oriental Orthodoxy and some other churches, Orthodox bishops trace their lineage back to the Apostles through the process of Apostolic Succession. The Orthodox Church traces its development back through the Byzantine and Roman empires, to the earliest church established by St. Paul and the Apostles. It practices what it understands to be the original ancient traditions, believing in growth without change. In non-doctrinal matters the church had occasionally shared from local Greek, Slavic and Middle Eastern traditions, among others, in turn shaping the cultural development of these nations. The goal of the Orthodox Christian, from Baptism as an infant when sealed with the Holy Spirit and throughout life, is to continually draw near to God. This process is called theosis or deification and is a spiritual pilgrimage in which each person strives to become more holy and more "Christ Like" within Jesus Christ. The Biblical text used by the Orthodox includes the Greek Septuagint and the New Testament. It includes the seven Deuterocanonical Books, which are generally rejected by Protestants, and a very few other books that are in neither Western canon. Orthodox Christians use the term "Anagignoskomena" (a Greek word that means "readable", "worthy of reading") for the ten books that they accept but that are not in the Protestant 39-book Old Testament canon. They treat them on the same level as the others, and use them in the Divine Liturgy. Orthodox Christians believe scripture was revealed by the Holy Spirit to its inspired human authors. They also use icons as a part of their personal and liturgical worship and prayer life. An Orthodox Christian will often have Icons in their home and Icons are a prominent feature in Orthodox Churches. They are used in prayer and veneration of the Saint or Biblical event they represent, but are not objects of worship themselves. The Orthodox Church maintains that this is not idolatry, while three-dimensional statues are rejected. Icons depict Jesus Christ, the Virgin Mary, the Saints and important Biblical events. They have been part of Orthodox Christianity since the beginning of the church. Almost from the very beginning, Christians referred to the Church as the "One, Holy, Catholic [from the Greek καθολική, or universal] and Apostolic Church". Today, in addition to the Orthodox Church, a number of other Christian churches lay claim to this title (including the Roman Catholic Church, the Anglican Communion, the Assyrian Church and the Oriental Orthodox Church); however, the Orthodox Church considers these other churches to be schismatic and, in some cases, heretical. In the Orthodox view, the Assyrians and Orientals left the Orthodox Church in the first few centuries after Christ, and the Roman Catholics became the largest group to do so, as the result of the East-West Schism, traditionally dated in 1054. The term “Orthodox” translates from the Greek to mean “correctly believing” or "correctly glorifying" (from the adjective orthos = correct, right and the verb dokein = seem (to be the case) and thus by extension "believe" or the noun doxa = belief/opinion) and was adopted by the Church in order to distinguish itself from what was becoming a larger and larger body of non-orthodox Christian denominations. Several other ancient churches in Eastern Europe, Western Asia and North Africa also use the term Orthodox, but are distinct from the Orthodox Church as described in this article. Orthodox could also mean "in agreement with right belief" and "celebrating the truth". What unites the Orthodox is theology, although there are variations in style depending on country of origin and/or local custom. These local customs are referred to as differences in typica and are accepted by church leaders since they are not perceived to conflict theologically with basic Eastern Orthodox teachings. Thus it is that many Eastern Orthodox Churches adopt a national title (e.g. Bulgarian Orthodox, Georgian Orthodox, Greek Orthodox, Macedonian Orthodox (not officially recognized), Russian Orthodox, Romanian Orthodox, Serbian Orthodox, etc.) and this title serves to distinguish which language, which bishops, and which of the typica is followed by that particular congregation. Members of the Church are fully united in faith and the Sacred Mysteries with all Eastern Orthodox congregations, regardless of nationality. Differences in praxis (practice) tend to be slight; they involve such things as the order in which a particular set of hymns are sung or what time a particular service is performed. In general, an Eastern Orthodox Christian could travel the globe and feel familiar with the services even if he did not know the language in which they were celebrated. The Orthodox Church considers Jesus Christ to be the head of the Church and the Church to be His body. Thus, despite widely held popular belief outside the Eastern Orthodox cultures, there is not one bishop at the head of the Eastern Orthodox Church; references to the Patriarch of Constantinople as a leader equivalent or comparable to a pope in the Roman Catholic Church are mistaken. It is believed that authority and the grace of God is directly passed down to Eastern Orthodox bishops and clergy through the laying on of hands—a practice started by the apostles, and that this unbroken historical and physical link is an essential element of the true church (Acts 8:17, 1 Tim 4:14, Heb 6:2). However, the church asserts that Apostolic Succession also requires Apostolic Faith, and bishops without Apostolic Faith, who are in heresy, forfeit their claim to Apostolic Succession. Each bishop has a territory (see) over which he governs. His main duty is to make sure the traditions and practices of the Church are preserved. Bishops are equal in authority and cannot interfere in the jurisdiction of another bishop. Administratively, these bishops and their territories are organized into various autocephalous groups or synods of bishops who gather together at least twice a year to discuss the state of affairs within their respective sees. While bishops and their autocephalous synods have the ability to administer guidance in individual cases, their actions do not usually set precedents that affect the entire Church. Bishops are almost always chosen from the monastic ranks and must remain unmarried. There have been a number of times when alternative theological ideas arose to challenge the Orthodox faith. At such times the Church deemed it necessary to convene a general or "Great" council of all available bishops throughout the world. The Church considers the first seven ecumenical councils (held between the 4th and the 8th century) to be the most important; however, there have been more, specifically the Synods of Constantinople, 879–880, 1341, 1347, 1351, 1583, 1819, and 1872, the Synod of Iaşi (Jassy), 1642, and the Pan-Orthodox Synod of Jerusalem, 1672, all of which helped to define the Eastern Orthodox position. The ecumenical councils followed a democratic form; with each bishop having one vote. Though present and allowed to speak before the council, members of the Imperial Roman/Byzantine court, abbots, priests, monks and laymen were not allowed to vote. The primary goal of these Great Synods was to verify and confirm the fundamental beliefs of the Church as truth, and to remove as heresy any false teachings that would threaten the Church. The Pope of Rome, at that time, held the position of “First Among Equals”. And while he was not present at any of the councils he continued to hold this title until the East-West Schism of 1054 AD. One of the decisions made by the First Council of Constantinople (the second ecumenical council, meeting in 381) and supported by later such councils was that the Patriarch of Constantinople should be given equal honor with the Pope of Rome since Constantinople was considered to be the "New Rome". The Pope's name would be first in the Diptychs because Rome was the elder capital (see Canon 28 of the Fourth Ecumenical Council). The Patriarch, like the Pope before him enjoys the title of “First among Equals”. This is not, however, meant to imply that he is the leader of the Orthodox Church. Based on the numbers of adherents, Eastern Orthodoxy is the second largest Christian communion in the world after the Roman Catholic Church. The most common estimates of the number of Eastern Orthodox Christians worldwide is approximately 300 Million . Eastern Orthodoxy is the largest single religious faith in Belarus (85%), Bulgaria (83%), Republic of Macedonia (72%), Cyprus (80%), Georgia (89%), Greece (95%), Moldova (98%), Montenegro (74%), Romania (87%), Serbia (84%), Russia (80%), and Ukraine (80%). The number of Eastern Orthodox adherents represents about 36% of the population in Bosnia and Herzegovina. In Albania the adherents number around 25% out of a 40% Christian population, the other being Roman Catholic. As the dominant religion in northern Kazakhstan, it represents 40% of Kazakhstan, and 4% of Lithuania, 9% of Latvia , and 13% of the Estonian population. Large Eastern Orthodox Christian communities exist in the Mediterranean countries of Syria (80% of Christian pop), Lebanon (40% of Christian pop) and 10% of the whole Lebanese population, Jordan (80% of Christian pop), Israel, the West Bank and Gaza Strip (Palestinian Christians) with some families able to trace their ancestry to the earliest Christians of the Holy Land. In addition, there are also significant Eastern Orthodox communities in Western Europe (solely the transplanted Macedonian, Romanian, Serbian, Albanian, Greek and Russian communities), Africa, Asia, Australia, North America, and South America through the pattern of immigration from Eastern Europe and the Middle East in the last 400 or some years. The numerous Protestant groups in the world, if taken all together, outnumber the Eastern Orthodox, but they differ theologically and do not form a single communion. Eastern Orthodox Christians believe in the Trinity. The Father is the cause or origin of the Godhead, from whom the Son is begotten eternally and also from whom the Holy Spirit proceeds eternally. The Holy Trinity is three, distinct, divine persons (hypostases), without overlap or modality among them, who share one divine essence (ousia)—uncreated, immaterial and eternal. Eastern Orthodox doctrine regarding the Holy Trinity is summarized in the Nicene Creed (Symbol of Faith). In discussing God's relationship to His creation, Eastern Orthodoxy used the concept of a distinction between God's eternal essence which is totally transcendent and His uncreated energies which is how He reaches us. The God who is transcendent and the God who touches us are one and the same (i.e. His energies are not some sort of thing that comes out of God or that he produces, but rather they are God himself distinct, yet inseparable from, from his inner being). At some point in the beginnings of human existence man was faced with a choice, to learn the difference between good and evil through observation or through participation. The biblical story of Adam and Eve represents this choice by mankind to participate in evil. This event is commonly referred to as “the fall of man” and it represents a fundamental change in human nature. When Orthodox Christians refer to Original Sin what they mean is this adoption of evil into human nature. As a result of this sin, mankind was doomed to be separated from God. This was mankind's ultimate dilemma. The solution to this horrible problem was for God to effect another change in human nature. Orthodox Christians believe that Christ Jesus was both God and Man absolutely. He was born, lived and died. Through God's participation in humanity, human nature is changed thus saving us from the fate of hell. The effective change included all those who had died from the beginning of time – saving everyone including Adam and Eve. This process, to Orthodox Christians is what is meant by “Salvation”. The ultimate goal is theosis – an even closer union with God and closer likeness to God than existed in the Garden of Eden. The Resurrection of Christ is the central event in the liturgical year of the Eastern Orthodox Church and is understood in literal terms as a real historical event. Jesus Christ, the Son of God, was crucified and died, descended into Hades, rescued all the souls held there through sin; and then, because Hades could not restrain the infinite God, rose from the dead, thus saving the human race. Through these events, Christ released us from the bonds of Hades and then came back to the living as both man and God. According to Eastern Orthodox tradition, each human being may partake of this immortality, which would have been impossible without the Resurrection; it is the main promise held out by God in the New Testament. Every holy day of the Eastern Orthodox liturgical year relates to the Resurrection directly or indirectly. Every Sunday is dedicated to celebrating the Resurrection and the triune God. In the liturgical commemorations of the Passion of Christ during Holy Week there are frequent allusions to the ultimate victory at its completion. The Eastern Orthodox Church considers itself to be the historical and organic continuation of the original Church founded by Christ and His apostles. The faith taught by Jesus to the apostles, given life by the Holy Spirit at Pentecost, and passed down to future generations uncorrupted, is known as Holy Tradition. The primary and authoritative witness to Holy Tradition is the Bible, texts written by the apostles or those in the Early Church, and approved by Church leaders under the guidance of the Holy Spirit The Bible reveals God's will, the relationship between the Israelites and God, the wonders of Christ and the early history of the Church. As the Bible has an inspired origin it is central to the life of the Church. Scriptures are understood to contain historical fact, poetry, idiom, metaphor, simile, moral fable, parable, prophecy, and wisdom literature. Thus, the Scriptures are never used for personal interpretation, but always seen within the context of Holy Tradition, which gave birth to the Scripture. Eastern Orthodoxy maintains that belief in a doctrine of sola scriptura would most lead to error since the truth of Scripture cannot be separated from the traditions from which it arose. Eastern Orthodox Christians therefore believe that the only way to correctly understand the Bible is within the Church. From the moment Christ commissioned the generations of apostles, the Church (εκκλησία – ekklesia) began to grow. The organic model for the growth of this community stems from the title of 'the chosen' as being those Hebrews who were chosen by God to leave Egypt with Moses the patriarch and enter into the land of promise. In this sense, the aim of the councils was never to expand or fuel a popular need for a clearer or relevant picture of the original apostolic teaching. Rather, the theologians spoke to address the issues of external schools of thought who wished to distort the simplicity and neutrality of the apostolic teaching for personal or political gain. That being said, the consistency of the Eastern Orthodox faith is entirely dependent on the Holy Tradition of the accepted corpus of belief – the decisions ratified by the fathers of the seven ecumenical councils, and this is only done at the beginning of a consecutive council so that the effects of the decisions of the prior council can be audited and verified as being both conceptual sound and pragmatically feasible and beneficial for the church as a whole. This process is not one of universal doctrinal evolution but of localized contextual protection. Thus the Eastern Orthodox claim that the gospel as they have received it is the same gospel that the apostles shared, that which the fathers had taught, and the which the councils confirmed – not what any particular individual has said. The Theotokos of Vladimir, one of the most venerated of Eastern Orthodox Christian icons of the Virgin Mary. The Eastern Orthodox Church believes death and the separation of body and soul to be unnatural; a result of the Fall of Man. They also hold that the congregation of the Church comprises both the living and the dead. All persons currently in heaven are considered to be saints, whether their names are known or not. There are, however, those saints of distinction whom God has revealed as particularly good examples for us. When a saint is revealed and ultimately recognized by a large portion of the Church a service of official recognition (glorification) is celebrated. This does not 'make' the person a saint, it merely recognizes the fact and announces it to the rest of the Church. A day is prescribed for the saint's celebration, hymns composed and icons are created. Numerous saints are celebrated on each day of the year. They are venerated (shown great respect and love) but not worshiped, for worship is due to God alone. In showing the saints this love and requesting their prayers, it is believed by the Eastern Orthodox that they thus assist in the process of salvation for others. Pre-eminent among the saints is the Virgin Mary, the Theotokos ("birthgiver of God"). In Eastern Orthodox theology, the Theotokos is the fulfillment of the Old Testament archetype revealed in the Ark of the Covenant, because she carried the New Covenant in the person of Christ; thus, the Eastern Orthodox consider her the Ark of the New Covenant, and give her the respect and reverence as such. The Theotokos was chosen by God and freely co-operated in that choice to be the Mother of Jesus Christ, the God-man. The Eastern Orthodox believe that the Christ Child from the moment of conception was both fully God and fully Man. She is thus called 'Theotokos' as an affirmation of the divinity of the One to whom she gave birth. It is also believed that her virginity was not compromised in conceiving God-incarnate, that she was not harmed and that she remained forever a virgin; scriptural references to "brothers" of Christ are interpreted as kin, given that the word 'brother' was used in multiple ways, just as the term "father". Due to her unique place in salvation history, Mary is honored above all other saints and especially venerated for the great work that God accomplished through her. Because of the holiness of the lives of the saints, their bodies and physical items connected with them are regarded by the Church as also holy. Many miracles have been reported throughout history connected with the saint's relics, often including healing from disease and injury. The veneration and miraculous nature of relics continues from Biblical times. Eastern Orthodox Christians believe that when a person dies the soul is temporarily separated from the body. Though it may linger for a short period on Earth, it is ultimately escorted either to paradise (Abraham's bosom) or the darkness of Hades, following the Temporary Judgment. Eastern Orthodox do not accept the doctrine of Purgatory which is held by Roman Catholicism. The soul's experience of either of these states is only a “foretaste”—being experienced only by the soul—until the Final Judgment, when the soul and body will be reunited. The Eastern Orthodox believe that the state of the soul in Hades can be affected by the love and prayers of the righteous up until the Last Judgment. For this reason the Church offers a special prayer for the dead on the third day, ninth day, fortieth day, and the one-year anniversary after the death of an Eastern Orthodox Christian. There are also several days throughout the year that are set aside for general commemoration of the departed, sometimes including nonbelievers. These days usually fall on a Saturday, since it was on a Saturday that Christ lay in the Tomb. While the Eastern Orthodox consider the text of the Apocalypse (Book of Revelation) to be a part of Scripture, it is also regarded to be a mystery. Speculation on the contents of Revelation are minimal and it is never read as part of the regular order of services. Those theologians who have delved into its pages tend to be amillennialist in their eschatology, believing that the "thousand years" spoken of in biblical prophecy refers to the present time: from the Crucifixion of Christ until the Second Coming. Whilst it is not usually taught in church it is often used as a reminder of God's promise to those who love Him, and of the benefits of avoiding sinful passions. Iconographic depictions of the Final Judgment are often portrayed on the back wall of the church building to remind the departing faithful to be vigilant in their struggle against sin. Likewise it is often painted on the walls of the Trapeza (refectory) in a monastery where monks may be inspired to sobriety and dis-attachment from worldly things while they eat. The church building has many symbolic meanings; perhaps the oldest and most prominent is the concept that the Church is the Ark (as in Noah's) in which the world is saved from the flood of temptations; therefore, most Eastern Orthodox Churches are rectangular in design. Another popular configuration, especially for churches with large choirs is cruciform or cross-shaped. Architectural patterns vary in shape and complexity, with chapels sometimes added around the main church, or triple altars; but in general, the symbolic layout of the church remains the same. Everything in the Eastern Orthodox Church has a purpose and a meaning revealing God's revelation to man. At the front, or Eastern end of the church, is a raised dais with an icon-covered screen or wall (iconostasis or templon) separating the nave from the sanctuary. In the center of this wall is the entrance to the altar known as the “Beautiful Gate” through which only the clergy may pass. There are also a right and left side door on the front of the iconostasis, one depicting the archangel, Michael and the other Gabriel. The priest and altar boys enter and exit through these doors during appropriate parts of the Divine Liturgy. Immediately to the right of the main gate you will always find icon of Jesus Christ. Other icons depicted on the iconostatis are the Mother of God, John the Baptist and the Saint after which the church is named. In front of the iconostasis is the Bishop's Chair, where a visiting Bishop or Metropolitan will often sit as a place of honor during the Divine Liturgy. Eastern Orthodox priests, when standing at the altar face toward the altar (facing East) so that both the Priest and congregation are praying to God in Heaven together. The sanctuary contains the Holy Altar, representing the place where Christ was laid in the tomb and on the third day, rose. A cross stands behind the altar. On the altar are the items used to sanctify the bread and wine for communion, including a gold chalice and communion spoon. Also found on the altar table is the Antimins, the Book of the Gospel containing the Words spoken by the Lord, and not the additional components of the Bible. The antimins is a silk cloth used during the sanctification of the Divine Gifts. The antimins may contain the relics of a Saint. When a church is consecrated by a Bishop, there is a formal service or prayers and sanctification in the name of the Saint that the church is named after. The Bishop will also often present a small relic of a Saint to place in or on the altar as part of the consecration of a new church. The Divine Liturgy may only be performed once a day on any particular Antimins. Thus a second Liturgy on the same Altar Table that same day would require the use of a second Antimins, typically from another Eastern Orthodox church. This means that any parish or congregation is able to celebrate only one Eucharist per day, in order to express the Catholicity of the Church by avoiding "private masses". The term 'icon' comes from the Greek word eikona, which simply means image. The Eastern Orthodox believe that the first icons of Christ and the Virgin Mary were painted by Luke the Evangelist. Icons are filled with symbolism designed to convey information about the person or event depicted. For this reason, icons tend to be formulaic, following a prescribed methodology for how a particular person should be depicted, including hair style, body position, clothing, and background details. Icon painting, in general, is not an opportunity for artistic expression, though each iconographer brings a vision to the piece. It is far more common for an icon to be copied from an older model, though with the recognition of a new saint in the church, a new icon must be created and approved. The personal and creative traditions of Western European religious art are largely lacking in Eastern Orthodox iconography before the 17th century, when Russian iconography began to be strongly influenced by religious paintings and engravings from both Protestant and Roman Catholic Europe. Greek iconography also began to take on a strong western influence for a period and the difference between some Eastern Orthodox icons and western religious art began to vanish. More recently there has been a trend of returning to the more traditional and symbolic representations. Free-standing statues (three dimensional depictions) are almost non-existent within the Eastern Orthodox Church. This is partly due to the rejection of the previous pagan Greek age of idol worship and partly because icons are meant to show the spiritual nature of man, not the sensual earthly body. Bas reliefs, however, became common during the Byzantine period and led to a tradition of covering a painted icon in a silver or gold 'riza' in order to preserve the icon. Such bas relief coverings usually leave the faces and hands of the saints exposed for veneration. Icons are not considered by the Eastern Orthodox to be idols or objects of worship. The parameters of their usage were clearly spelled out by the 7th ecumenical council. Justification for their usage utilises the following logic: before God took human form in Christ, no material depiction was possible and therefore blasphemous even to contemplate. Once God became incarnate, depiction was possible. As Christ is God, it is justified to hold in one's mind the image of God-incarnate. Likewise, when one venerates an icon, it is not the wood or paint that are venerated but rather the individual shown, just as it is not the paper one loves when one might kiss the photograph of a loved one. As Saint Basil famously proclaimed, honour or veneration of the icon always passes to its archetype. Following this reasoning, the veneration of the glorified human saint made in God's image, is always a veneration of the divine image, and hence God as foundational archetype. Icons can be found adorning the walls of churches and often cover the inside structure completely. Most Eastern Orthodox homes have an area set aside for family prayer, usually an eastern facing wall, where are hung many icons. Tales of miraculous icons are not uncommon, though it has always been considered that the message of such an event was for the immediate faithful involved and therefore does not usually attract crowds. Some miraculous icons whose reputations span long periods of time nevertheless become objects of pilgrimage along with the places where they are kept. As several Eastern Orthodox theologians and saints have explored in the past, the icon's miraculous nature is found not in the material, but in the glory of the saint who is depicted. The icon is a window, in the words of St Paul Florensky, that actually participates in the glory of what it represents. An iconostasis, also called the templon, is a wall of icons and religious paintings, separating the nave from the sanctuary in a church. Iconostasis also refers to a portable icon stand that can be placed anywhere within a church. The modern iconostasis evolved from the Byzantine templon in the eleventh century. The evolution of the iconostasis probably owes a great deal to 14th-century Hesychast mysticism and the wood-carving genius of the Russian Orthodox Church. The first ceiling-high, five-leveled Russian iconostasis was designed by Andrey Rublyov in the cathedral of the Dormition in Vladimir in 1408. The separation between sanctuary and nave accomplished by the iconostasis is not mandatory, albeit it is common practice. Depending on circumstance, the role of the iconostasis can be played by masonry, carved panels, screens, curtains, railings, a cord or rope, plain icons on stands, steps, or nothing at all. Depictions of the Cross within the Eastern Orthodox Church are numerous and often highly ornamented. Some carry special significance. The Tri-Bar Cross, as seen to the right, has three bars instead of the single bar normally attached. The small top crossbar represents the sign that Pontius Pilate nailed above Christ's head. It often is inscribed with an acronym meaning “Jesus of Nazareth, King of the Jews”; however, it is often replaced or amplified by the phrase "The King of Glory" in order to answer Pilate's statement with Christ's affirmation, "My Kingdom is not of this world". The bottom bar is slanted for two reasons, to represent the very real agony which Christ experienced on the cross (a refutation of Docetism) and to signify that the thief on Christ's right chose the right path while the thief on the left did not. Other crosses associated with the Eastern Orthodox Church are the more traditional single-bar crosses, budded designs, the Jerusalem cross (cross pattée), Celtic crosses, and others. Eastern Orthodox services are sung nearly in their entirety. Services consist in part of a dialogue between the clergy and the people (often represented by the choir or the Psaltis Cantor). In each case the prayers are sung or chanted following a prescribed musical form. Almost nothing is read in a normal speaking voice, with the exception of the homily if one is given. Because the human voice is seen as the most perfect instrument of praise, musical instruments (organs, guitars, etc.) are not generally used to accompany the choir. 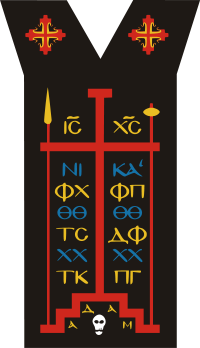 The church has developed eight Modes or Tones, (see Octoechos) within which a chant may be set, depending on the time of year, feast days, or other considerations of the Typikon. There are numerous versions and styles that are traditional and acceptable and these vary a great deal between cultures. It is common, especially in the United States, for a choir to learn many different styles and to mix them, singing one response in Greek, then English, then Russian, etc. It should also be noted that in the Russian tradition there have been some very famous composers of Church music such as Tchaikovsky and Rachmaninoff; and many Church tones can likewise be seen influencing their music. As part of the legacy handed down from its Judaic roots, incense is used during all services in the Eastern Orthodox Church as an offering of worship to God as it was done in the Jewish First and Second Temples in Jerusalem (Exodus chapter 30). Traditionally, the base of the incense used is the resin of Boswellia thurifera, also known as frankincense, but the resin of fir trees has been used as well. It is usually mixed with various floral essential oils giving it a sweet smell. Incense represents the sweetness of the prayers of the saints rising up to God (Psalm 141:2, Revelation 5:8, 8:4). The incense is burned in an ornate golden censer that hangs at the end of four chains representing the Trinity. Two chains represent the human and Godly nature of the Son, one chain for the Father and one chain for the Holy Spirit. The lower cup represents the earth and the upper cup the heaven. In the Greek and Syrian traditions there are 12 bells hung along these chains representing the 12 apostles (usually no bells in Slavic tradition). There are also 72 links representing 72 evangelists. The charcoal represents the sinners. Fire signifies the Holy Spirit and frankincense the good deeds. The incense also represents the grace of the Holy Trinity. The censer is used (swung back and forth) by the priest/deacon to venerate all four sides of the altar, the holy gifts, the clergy, the icons, the congregation, and the church structure itself. According to Eastern Orthodox theology, the purpose of the Christian life is to attain theosis, the mystical union of man with God. This union is understood as both collective and individual. St. Athanasius of Alexandria, wrote concerning the Incarnation that, "He (Jesus) was made man that we might be made god (θεοποιηθῶμεν)". See 2 Peter 1:4, John 10:34–36, Psalm 82:6. The entire life of the church is oriented towards making this possible and facilitating it. In the Eastern Orthodox Church the terms “Mystery” or “The Mysteries” refer to the process of theosis. While it is understood that God theoretically can do anything instantly and invisibly, it is also understood that he generally chooses to use material substance as a medium in order to reach people. The limitations are those of mankind, not God. Matter is not considered to be evil by the Eastern Orthodox. Water, oil, bread, wine, etc., all are means by which God reaches out to allow people to draw closer to him. How this process works is a “Mystery”, and cannot be defined in human terms. These Mysteries are surrounded by prayer and symbolism so that their true meaning will not be forgotten. Those things which in the West are often termed Sacraments or sacramentals are known among the Eastern Orthodox as the Sacred Mysteries. While the Roman Catholic Church numbers seven Sacraments, and many Protestant groups list two (Baptism and the Eucharist) or even none, the Eastern Orthodox do not limit the number. However, for the sake of convenience, catechisms will often speak of the seven Great Mysteries. Among these are Holy Communion (the most direct connection), Baptism, Chrismation, Confession, Unction, Matrimony, and Ordination. But the term also properly applies to other sacred actions such as monastic Tonsure or the blessing of holy water, and involves fasting, almsgiving, or an act as simple as lighting a candle, burning incense, praying or asking God's blessing on food. Baptism is the mystery which transforms the old, sinful man into the new, pure man; the old life, the sins, any mistakes made are gone and a clean slate is given. Through baptism one is united to the Body of Christ by becoming a member of the Eastern Orthodox Church. During the service water is blessed. The catechumen is fully immersed in the water three times in the name of the Holy Trinity. This is considered to be a death of the "old man" by participation in the crucifixion and burial of Christ, and a rebirth into new life in Christ by participation in his resurrection. Properly a new name is given, which becomes the person's name. Children of Eastern Orthodox families are normally baptized shortly after birth. Converts to Eastern Orthodoxy (even converts from other Christian denominations) are usually formally baptized into the Eastern Orthodox Church though exceptions are sometimes made. Those who have left Eastern Orthodoxy and adopted a new religion, if they return to their Eastern Orthodox roots, are usually received back into the church through the mystery of Chrismation. Properly, the mystery of baptism is administered by bishops and priests; however, in emergencies any Eastern Orthodox Christian can baptize. In such cases, should the person survive the emergency, it is likely that the person will be properly baptized by a priest at some later date. This is not considered to be a second baptism, nor is it imagined that the person is not already Eastern Orthodox, but rather it is a fulfillment of the proper form. The service of baptism used in Eastern Orthodox churches has remained largely unchanged for over 1500 years. This fact is witnessed to by St. Cyril of Jerusalem (d. 386), who, in his Discourse on the Sacrament of Baptism, describes the service in much the same way as is currently in use. Chrismation (sometimes called confirmation) is the mystery by which a baptized person is granted the gift of the Holy Spirit through anointing with Holy Chrism. It is normally given immediately after baptism as part of the same service, but is also used to receive lapsed members of the Eastern Orthodox Church. As baptism is a person's participation in the death and resurrection of Christ, so Chrismation is a person's participation in the coming of the Holy Spirit at Pentecost. 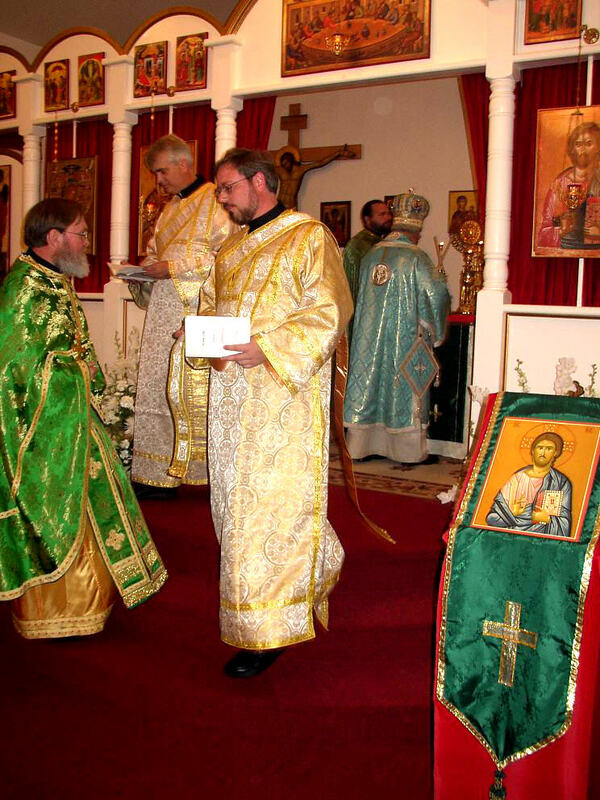 A baptized and chrismated Eastern Orthodox Christian is a full member of the Church, and may receive the Eucharist regardless of age. See also: Fasting: Eastern Orthodoxy & Eastern Catholicism. The number of fast days varies from year to year, but in general the Eastern Orthodox Christian can expect to spend a little over half the year fasting at some level of strictness. There are spiritual, symbolic, and even practical reasons for fasting. In the Fall from Paradise mankind became possessed by a carnal nature; that is to say, he became inclined towards the passions. Through fasting, Eastern Orthodox Christians attempt to return to the relationship of love and obedience to God enjoyed by Adam and Eve in Paradise in their own lives, by refraining from carnal practices, by bridling the tongue (James 3:5–6), confession of sins, prayer and almsgiving. Fasting is seen as purification and the regaining of innocence. Through obedience to the Church and its ascetic practices the Eastern Orthodox Christian seeks to rid himself or herself of the passions (The desires of our fallen carnal nature). All Eastern Orthodox Christians are expected to fast following a prescribed set of guidelines. They do not view fasting as a hardship, but rather as a privilege and joy. The teaching of the Church fixes both the times and the amount of fasting that is expected as a minimum for every member. For greater ascesis, some may choose to go without food entirely for a short period of time. A complete three-day fast at the beginning and end of a fasting period is not unusual, and some fast for even longer periods, though this is usually practiced only in monasteries. In general, fasting means abstaining from meat and meat products, dairy (eggs and cheese) and dairy products, fish, olive oil, and wine. Wine and oil—and, less frequently, fish—are allowed on certain feast days when they happen to fall on a day of fasting; but animal products and dairy are forbidden on fast days, with the exception of "Cheese Fare" week which precedes Great Lent, during which dairy products are allowed. Wine and oil are usually also allowed on Saturdays and Sundays during periods of fast. In some Eastern Orthodox traditions, caviar is permitted on Lazarus Saturday, the Saturday before Palm Sunday, although the day is otherwise a fast day. Married couples also abstain from sexual relations on fast days, that they may devote themselves to prayer (I Corinthians 7:5). While it may seem that fasting in the manner set forth by the Church is a strict rule, there are circumstances where a person's spiritual guide may allow a dispensation because of some physical necessity (e.g. those who are pregnant or infirm, the very young and the elderly, or those who have no control over their diet, such as prisoners or soldiers). The Nativity Fast (Advent or "Winter Lent") which is the 40 days preceding the Nativity of Christ (Christmas), beginning on November 15 and running through December 24. This fast becomes more severe after December 20, and Christmas Eve is observed a strict fast day. In addition to these fasting seasons, Eastern Orthodox Christians fast on every Wednesday (in commemoration of Christ's betrayal by Judas Iscariot), and Friday (in commemoration of Christ's Crucifixion) throughout the year. Monastics often fast on Mondays (in imitation of the Angels, who are commemorated on that day in the weekly cycle, since monastics are striving to lead an angelic life on earth, and angels neither eat nor drink). Eastern Orthodox Christians who are preparing to receive the Eucharist do not eat or drink at all from midnight until after taking Holy Communion. A similar total fast is expected to be kept on the Eve of Nativity, the Eve of Theophany (Epiphany), Great Friday and Holy Saturday for those who can do so. There are other individual days observed as fasts (though not as days of total fasting) no matter what day of the week they fall on, such as the Beheading of St. John the Baptist on August 29 and the Exaltation of the Holy Cross on September 14. It is considered a greater sin to advertise one's fasting than not to participate in the fast. Fasting is a purely personal communication between the Eastern Orthodox Christian and God. If one has health concerns, or responsibilities that cannot be fulfilled because of fasting, then it is perfectly permissible not to fast. An individual's observance of the fasting laws is not to be judged by the community (Romans 14:1–4), but is a private matter between him and his Spiritual Father or Confessor. "Almsgiving" refers to any charitable giving of material resources to those in need. Along with prayer and fasting, it is considered a pillar of the personal spiritual practices of the Eastern Orthodox Christian tradition. Almsgiving is particularly important during periods of fasting, when the Eastern Orthodox believer is expected to share the monetary savings from his or her decreased consumption with those in need. As with fasting, bragging about the amounts given for charity is considered anywhere from extremely rude to sinful. The Eucharist is at the center of Eastern Orthodox Christianity. In practice, it is the partaking of the Body and Blood of Jesus Christ in the midst of the Divine Liturgy with the rest of the church. The bread and wine are believed to become the genuine Body and Blood of the Christ Jesus through the operation of the Holy Spirit. The Eastern Orthodox Church has never described exactly how this occurs, or gone into the detail that the Roman Catholic Church has in the West. The doctrine of transubstantiation was formulated after the Great Schism took place, and the Eastern Orthodox Churches have never formally affirmed or denied it, preferring to state simply that it is a "Mystery". Communion is given only to baptized and chrismated Eastern Orthodox Christians who have prepared by fasting, prayer and confession. The priest will administer the Gifts with a spoon, called a "cochlear", directly into the recipient's mouth from the chalice. From baptism young infants and children are carried to the chalice to receive Holy Communion. Because of the Eastern Orthodox understanding of man's fallen nature in general those who wish to commune prepare themselves in a way that reflects man in paradise. First, the individual prepares by having his confession heard and the prayer of repentance read over him by a priest. The person fasts from animal products for a number of days prior (usually from Wednesday on) in order to live like Adam in the garden eating only fruits and vegetables. He refrains from sexual relations with his spouse since union with Christ through communion is the most desirable thing man wants Likewise he will refrain from communion should he have a nocturnal emission or, if it is a woman, she is menstruating. The person will increase their prayer rule adding the prescribed prayers in preparation for communing. Finally, the person will fast completely from food and drink from the evening of the previous day (usually sunset on Saturday if communing on Sunday). Eastern Orthodox Christians who have committed sins but repent of them, and who wish to reconcile themselves to God and renew the purity of their original baptisms, confess their sins to God before a spiritual guide who offers advice and direction to assist the individual in overcoming their sin. Parish priests commonly function as spiritual guides, but such guides can be any person, male or female, who has been given a blessing to hear confessions. Spiritual guides are chosen very carefully as it is a mandate that once chosen, they must be obeyed. Having confessed, the penitent then has his or her parish priest read the prayer of repentance over them. Sin is not viewed by the Eastern Orthodox as a stain on the soul that needs to be wiped out, or a legal transgression that must be set right by a punitive sentence, but rather as a mistake made by the individual with the opportunity for spiritual growth and development. An act of Penance (epitemia), if the spiritual guide requires it, is never formulaic, but rather is directed toward the individual and their particular problem, as a means of establishing a deeper understanding of the mistake made, and how to effect its cure. Though it sounds harsh, temporary excommunication is fairly common (The Eastern Orthodox require a fairly high level of purity in order to commune, therefore certain sins make it necessary for the individual to refrain from communing for a period). Confession and repentance are required in order to raise the individual to a level capable of communing (though no one is truly worthy). Because full participatory membership is granted to infants, it is not unusual for even small children to confess; though the scope of their culpability is far less than an older child, still their opportunity for spiritual growth remains the same. The Church does recognize that there are rare occasions when it is better that couples do separate, but there is no official recognition of civil divorces. For the Eastern Orthodox, the marriage is indissoluble as in it should not be broken, the violation of such a union, perceived as holy, being an offense resulted from either adultery or the prolonged absence of one of the partners. Thus, permitting remarriage is an act of compassion of the Church towards sinful man. In the U.S., according to 2001 statistics, 14% of Eastern Orthodox marriages ended in an ecclesiastical divorce; a figure that, since it took no account of how many of the couples who entered such marriages took out a civil divorce, is not comparable with the figure of 43% given at that time for the proportion of all marriages that ended in a civil divorce, but which has been argued as indicating a probable total of only 15% of marriages celebrated in an Eastern Orthodox church led to any form of divorce. Divorced individuals are usually allowed to remarry though there is usually imposed on them a fairly severe penance by their bishop and the services for a second marriage in this case are more penitential than joyful. Widows are permitted to remarry without repercussion and their second marriage is considered just as valid as the first. One exception to this rule is the clergy and their wives. Should a married priest die, it is expected that his wife will retire to a monastery as soon as their children are out of the house. Widowed priests are not allowed to remarry and also frequently end up in monasteries. The service of Marriage in the Eastern Orthodox Church has two distinct parts: The Betrothal and The Crowning. The Betrothal includes: 1. The exchange of the rings, (it has always been the tradition of the Church to place the wedding ring on the right hand of the couple based on biblical references. This is seen very clearly in one of the prayers in the Betrothal Service. A portion of the prayer refers to the biblical references: “For You, O Lord, have declared that a pledge is to be given and held inviolate in all things. By a ring Joseph was given might in Egypt; by a ring Daniel was exalted in Babylon; by a ring our heavenly Father showed compassion upon His prodigal son, for He said, ‘Put a ring upon his right hand, kill the fatted calf, and let us eat and rejoice.’ Your own right hand, O Lord, armed Moses in the Red Sea. By word of Your truth were the Heavens established and the earth set upon her sure foundations; and the right hands of Your servants shall be blessed by Your mighty word, and by Your uplifted arm.” As we see, it was scripturally the practice to wear rings on the right hand, the hand of authority and power completing the pledge of commitment. The power and authority comes from the right hand of God. 2. The procession, the declaration of intent, and 3. The lighting of candles. At the Sacrament of Marriage the crowns are placed on the bride and groom’s heads as the following prayer is recited three times, “The servant of God, (groom’s name), is crowned to the handmaid of God, (bride’s name), in the Name of the Father, and of the Son, and of the Holy Spirit” three times. It is then repeated three times as the bride is crowned to the groom. We witness the groom and bride being crowned (visibly proclaimed) as the king and queen, respectively, of a new family, entrusted by God with the authority to rule their family in faith and love and harmony with Christ. They both share in this responsibility and privilege as a newly married couple. This is not simply being declared by the priest or even the Church, but by God Himself, as the following hymn is chanted three times: “O Lord, our God, crown them with glory and honor.” The crowns are then switched back and forth between the groom and bride's head, signifying that they completely share their lives together. The crowns also serve as a reminder of the crowns that await them in heaven, if they live their lives in faithfulness to God and each other.. Fr. John Meyendorff in his book, Marriage: An Orthodox Perspective, writes: “According to St. John Chrysostom, the crowns symbolized victory over the ‘passions.’ ” It is interesting to note that in the service of a second marriage the crowns are not to be used. All Eastern Orthodox Christians are expected to participate in at least some ascetic works, in response to the commandment of Christ to "come, take up the cross, and follow me." (Mark 10:21 and elsewhere) They are therefore all called to imitate, in one way or another, Christ himself who denied himself to the extent of literally taking up the cross on the way to his voluntary self-sacrifice. However, laypeople are not expected to live in extreme asceticism since this is close to impossible while undertaking the normal responsibilities of worldly life. Those who wish to do this therefore separate themselves from the world and live as monastics: monks and nuns. As ascetics par excellence, using the allegorical weapons of prayer and fasting in spiritual warfare against their passions, monastics hold a very special and important place in the Church. This kind of life is often seen as incompatible with any kind of worldly activity including that which is normally regarded as virtuous. Social work, school teaching, and other such work is therefore usually left to laypeople. Ascetics of Eastern Orthodox Church are recognized by their long hair, and in case of male monks long beards. The Schema worn by Eastern Orthodox Monks. There are three main types of monastics. Those who live in monasteries under a common rule are coenobitic. Each monastery may formulate its own rule, and although there are no religious orders in Eastern Orthodoxy some respected monastic centers such as Mount Athos are highly influential. Eremitic monks, or hermits, are those who live solitary lives. It is the yearning of many who enter the monastic life to eventually become solitary hermits. This most austere life is only granted to the most advanced monastics and only when their superiors feel they are ready for it. Hermits are usually associated with a larger monastery but live in seclusion some distance from the main compound. Their local monastery will see to their physical needs, supplying them with simple foods while disturbing them as little as possible. In between are those in semi-eremitic communities, or sketes, where one or two monks share each of a group of nearby dwellings under their own rules and only gather together in the central chapel, or katholikon, for liturgical observances. Many (but not all) Eastern Orthodox seminaries are attached to monasteries, combining academic preparation for ordination with participation in the community's life of prayer. Monks who have been ordained to the priesthood are called hieromonk (priest-monk); monks who have been ordained to the diaconate are called hierodeacon (deacon-monk). Not all monks live in monasteries, some hieromonks serve as priests in parish churches thus practicing "monasticism in the world". With the exception of bishops, who remain celibate, the Orthodox Church has always allowed priests and deacons to be married, provided the marriage takes place before ordination. In general it is considered preferable for parish priests to be married as they often act as counsel to married couples and thus can draw on their own experience. Unmarried priests usually are monks and live in monasteries, though there are occasions when, because of a lack of married priests, a monk-priest is temporarily assigned to a parish. Widowed priests and deacons may not remarry and it is common for such members of the clergy to retire to a monastery (see clerical celibacy). This is also true of widowed wives of clergy, who do not remarry and become nuns when their children are grown. There is serious discussion about reviving the order of deaconess, which fell into disuse in the first millennium; the deaconesses had both liturgical and pastoral functions within the church. Although it has fallen out of practice (the last deaconess was ordained in the 19th century) there is no reason why deaconesses could not be ordained today. Svetitskhoveli Cathedral is one of the oldest Eastern Orthodox churches in Georgia. Christianity spread rapidly throughout the Roman Empire. Some have attributed this in part because Greek was the lingua franca. Paul and the Apostles traveled extensively throughout the Empire, including Asia Minor, establishing Churches in major communities, with the first Churches appearing in Jerusalem and the Holy Land, then in Antioch, Ethiopia, Egypt, Rome, Alexandria, Athens, Thessalonica, and Byzantium, which, centuries later would become prominent as the New Rome. Christianity in the Roman Empire was met with some resistance as its adherents would refuse to comply with the Roman state (even at the threat of death) in offering sacrifice to the pagan gods. Despite being under persecution, the Church spread. The persecution dissipated upon the conversion of Emperor Constantine I in 324 AD. The Eighth Ecumenical Council was called in 879. It restored St. Photius to his See in Constantinople and condemned any alteration of the Nicene-Constantinopolitan Creed of 381. In addition to these councils there have been a number of significant councils meant to further define the Eastern Orthodox position. They are the Synods of Constantinople, 1484, 1583, 1755, 1819, and 1872, the Synod of Iaşi (Jassy), 1642, and the Pan-Orthodox Synod of Jerusalem, 1672. Eastern Christian culture reached its golden age during the high point of Byzantine Empire and continued to flourish in Russia, after the fall of Constantinople. Numerous autocephalous churches were established in Eastern Europe and Slavic areas. Those who disagreed with the Council of Chalcedon are sometimes called "Oriental Orthodox" to distinguish them from the Eastern Orthodox, who accepted the Council of Chalcedon. Oriental Orthodox are also sometimes referred to as "non-Chalcedonians", or "anti-Chalcedonians". The Oriental Orthodox Church denies that it is monophysite and prefers the term "miaphysite", to denote the "joined" nature of Jesus (two natures joined into one). Both the Eastern Orthodox and Oriental Orthodox churches formally believe themselves to be the continuation of the true church and the other fallen into heresy, although over the last several decades there has been some reconciliation. Both Churches agree there to have been a misunderstanding between the two in 451, that is to say that each side's terminology basically meant the same thing. In the ninth and tenth centuries, Christianity made great inroads into Eastern Europe, including Kievan Rus'. This work was made possible by the work of the Byzantine saints Cyril and Methodius. When Rastislav, the king of Moravia, asked Byzantium for teachers who could minister to the Moravians in their own language, Byzantine emperor Michael III chose these two brothers. Cyril and Methodius translated the Bible and many of the prayer books. As the translations prepared by them were copied by speakers of other dialects, the hybrid literary language Old Church Slavonic was created. Originally sent to convert the Slavs of Great Moravia, Cyril and Methodius were forced to compete with Frankish missionaries from the Roman diocese. Their disciples were driven out of Great Moravia in AD 886. Some of the disciples, namely Saint Clement of Ohrid, Saint Naum who were of noble Bulgarian descent and St. Angelarius, returned to Bulgaria where they were welcomed by the Bulgarian Tsar Boris I who viewed the Slavonic liturgy as a way to counteract Byzantine influence in the country. In a short time the disciples of Cyril and Methodius managed to prepare and instruct the future Slav Bulgarian clergy into the Glagolitic alphabet and the biblical texts and in AD 893, Bulgaria expelled its Greek clergy and proclaimed the Slavonic language as the official language of the church and the state. The success of the conversion of the Bulgarians facilitated the conversion of East Slavic peoples, most notably the Rus', predecessors of Belarusians, Russians, and Ukrainians. The work of the Thessaloniki brothers Cyril and Methodius and their disciples had a major impact to Serbs as well. However, they accepted Christianity collectively by families and by tribes (in the process between the 7th and the 9th century). In commemoration of their baptisms, each Serbian family or tribe began to celebrate an exclusively Serbian custom called Slava in a special way to honor the Saint on whose day they received the sacrament of Holy Baptism. It is the most solemn day of the year for all Serbs of the Eastern Orthodox faith and has played a role of vital importance in the history of the Serbian people. Slava is actually the celebration of the spiritual birthday of the Serbian people which the Church blessed and proclaimed it a Church institution. The missionaries to the East and South Slavs had great success in part because they used the people's native language rather than Greek, the predominant language of the Byzantine Empire or Latin as the Roman priests did. Today the Russian Orthodox Church is the largest of the Eastern Orthodox Churches followed by the Romanian Orthodox Church. In the 11th century what was recognised as the Great Schism took place between Rome and Constantinople, which led to separation from the Church of the West, the Roman Catholic Church, and the Eastern Byzantine Churches, now the Eastern Orthodox. There were doctrinal issues like the filioque clause and the authority of the Roman Pope involved in the split, but these were greatly exacerbated by political factors of both Church and state, and by cultural and linguistic differences between Latins and Greeks. 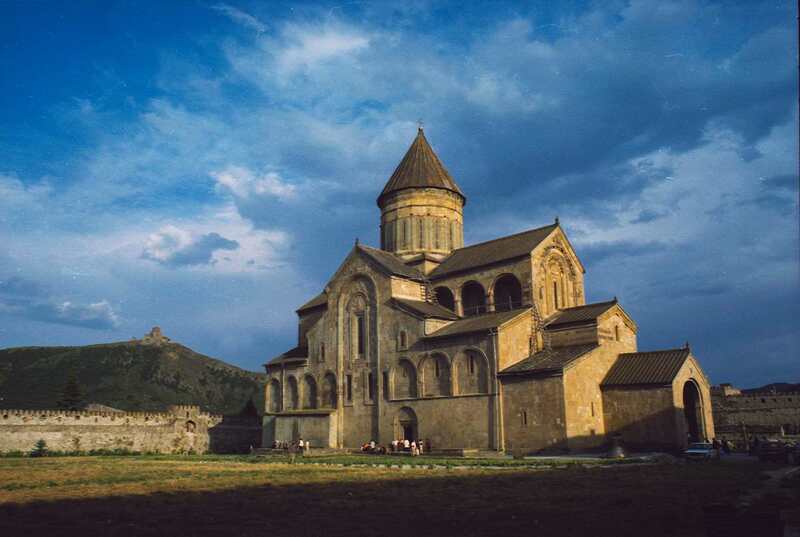 Prior to 1054, the Eastern and Western halves of the Church had frequently been in conflict, particularly during the periods of Eastern iconoclasm and the Photian schism. The final breach is often considered to have arisen after the capture and sacking of Constantinople by the Fourth Crusade in 1204; the final break with Rome occurred circa 1450. The sacking of Church of Holy Wisdom and establishment of the Latin Empire as a seeming attempt to supplant the Eastern Orthodox Byzantine Empire in 1204 is viewed with some rancour to the present day. In 2004, Pope John Paul II extended a formal apology for the sacking of Constantinople in 1204, which was importantly also strongly condemned by the Pope at the time (Innocent III, see reference at end of paragraph); the apology was formally accepted by Patriarch Bartholomew of Constantinople. Many things that were stolen during this time —holy relics, riches, and many other items—were not returned and are still held in various Western European cities, particularly Venice. In 1453, the Byzantine Empire fell to the Ottoman Empire. By this time Egypt had been under Muslim control for some seven centuries, but Eastern Orthodoxy was very strong in Russia which had recently acquired an autocephalous status; and thus Moscow called itself the Third Rome, as the cultural heir of Constantinople. As a result of the Ottoman conquest of the Byzantine Empire in 1453, and the Fall of Constantinople, the entire Eastern Orthodox communion of the Balkans and the Near East became suddenly isolated from the West. For the next four hundred years, it would be confined within Islamic world, with which it had little in common religiously or culturally. The Russian Orthodox Church and the Eastern Orthodox Churches from Wallachia and Moldavia were the only part of the Eastern Orthodox communion which remained outside the control of the Ottoman Empire. It is, in part, due to this geographical and intellectual confinement that the voice of Eastern Orthodoxy was not heard during the Reformation in sixteenth century Europe. It should not be surprising that this important theological debate often seems strange and distorted to the Orthodox; after all, they never took part in it and thus neither Reformation nor Counter-Reformation is part of their theological framework. Up until 1666, when Patriarch Nikon was deposed by the tsar, the Russian Orthodox Church had been independent of the State. In 1721 the first Emperor Peter I abolished completely the patriarchate and so the Church effectively became a department of the government, ruled by a Most Holy Synod composed of senior bishops and lay bureaucrats appointed by the Emperor himself. Since 1721 until the October Revolution of 1917, the Russian Orthodox Church was essentially transformed into a governmental agency, a tool used to various degrees by the tsars in the imperial campaigns of Russification. The Church was allowed by the State to levy taxes on the peasants. Therefore, the Church, along with the imperial regime, to which it belonged, came to be perceived as an enemy of the people by the Bolsheviks and the other Russian revolutionaries, mostly atheists. The revolution brought, however, a brief period of liberation for the Church: an independent patriarchate was reestablished briefly in 1917, until Lenin quashed the Church a few years later, imprisoning or killing many of the clergy and of the faithful. Part of the clergy escaped the Soviet persecutions by fleeing abroad, where they founded an independent church in exile, reunified with the Russian one in 2007. The Eastern Orthodox Church clergy in Russia were seen as sympathetic with the cause of the White Army in the Civil War (see White movement) after the October Revolution, and occasionally collaborated with it; Patriarch Tikhon's declared position was harshly anti-Bolshevik in 1918. This may have further strengthened the Bolshevik animus against the church. Before and after the October Revolution of November 7, 1917 (October 25 Old Calendar) there was a movement within the Soviet Union to unite all of the people of the world under Communist rule (see Communist International). This included the Eastern European bloc countries as well as the Balkan States. Since some of these Slavic states tied their ethnic heritage to their ethnic churches, both the peoples and their church were targeted by the Soviet. The Soviet Union was the first state to have as an ideological objective the elimination of religion. Toward that end, the Communist regime confiscated church property, ridiculed religion, harassed believers, and propagated atheism in the schools. Actions toward particular religions, however, were determined by State interests, and most organized religions were never outlawed. Some actions against Eastern Orthodox priests and believers along with execution included torture being sent to prison camps, labour camps or mental hospitals. The main target of the anti-religious campaign in the 1920s and 1930s was the Russian Orthodox Church, which had the largest number of faithful. Nearly all of its clergy, and many of its believers, were shot or sent to labor camps. Theological schools were closed, and church publications were prohibited. In the period between 1917 and 1940, the number of Eastern Orthodox Churches in the Russian Republic fell from 59,584 to less than 500. Between 1917 and 1935, 130,000 Orthodox priests were arrested. Of these, 95,000 were put to death, executed by firing squad. Albania was the first state to have declared itself officially fully atheist. In some other communist states such as Romania, the Eastern Orthodox Church as an organisation enjoyed relative freedom and even prospered, albeit under strict secret police control. That, however, did not rule out demolishing churches and monasteries as part of broader systematization (urban planning), state persecution of individual believers, and Romania stands out as a country which ran a specialised institution where many Eastern Orthodox (along with peoples of other faiths) were subjected to psychological punishment or torture and mind control experimentation in order to force them give up their religious convictions (see Piteşti prison). One of the most striking developments in modern historical Eastern Orthodoxy is the dispersion of Eastern Orthodox Christians to the West. Emigration from Greece and the Near East in the last hundred years has created a sizable Eastern Orthodox diaspora in Western Europe, North and South America, and Australia. In addition, the Bolshevik Revolution forced thousands of Russian exiles westward. As a result, Eastern Orthodoxy's traditional frontiers have been profoundly modified. Millions of Eastern Orthodox are no longer geographically "eastern" since they live permanently in their newly adopted countries in the West. Nonetheless, they remain Eastern Orthodox in their faith and practice. Virtually all the Eastern Orthodox nationalities – Greek, Georgian, Arab, Russian, Serbian, Macedonian, Albanian, Ukrainian, Armenian, Romanian, Bulgarian, Assyrian – are represented in the United States. There are also many converts to Eastern Orthodoxy of all conceivable ethnic backgrounds. In fact nearly half of the clergy of the Orthodox Church in America and Antiochian Orthodox Christian Archdiocese of North America are of a convert background. Eastern Orthodox missions are alive and well in the United States, Canada, and Mexico. Eastern Orthodoxy represents the majority of Eastern Christianity. Like Roman Catholics, the Eastern Orthodox trace their bishops back to the apostles through apostolic succession, venerate saints, especially Mary the Mother of God as the Theotokos, pray for the dead, and continue the ancient Christian practice of monasticism. Some, if not all, of these practices are rejected by the majority of Protestant groups, although they are partly retained in some of the earliest liturgical Protestant movements, such as the original German form of Lutheranism. They are also retained by some within the Anglican tradition as Anglicanism is generally considered to be a via media (middle way) between the Roman Catholic and Protestant traditions. Eastern Orthodoxy does not openly promote statuary, although it is not expressly condemned, instead limiting itself primarily to two-dimensional iconography. The Western theological concepts of original sin, predestination, purgatory, and particular judgment have had far less influence in Eastern Orthodoxy and are generally rejected by traditional Eastern Orthodox theologians. The Eastern Orthodox understand themselves to be the One Holy Catholic and Apostolic Church; the true Church established by Jesus Christ and placed into the care of the apostles. As almost all other Christian groups are in indirect schism with the Eastern Orthodox Church, mostly as a result of the Great Schism with the Roman Catholic Church at the turn of the second Christian millennium (prior to the additional schisms of the Protestant Reformation), these other groups are viewed as being Christian, but who in varying degrees lack full theological orthodoxy and orthopraxy. As such, all groups outside of the Eastern Orthodox Church are not seen as being members of the Church proper, but rather separated brethren who have failed to retain the fullness of the Christian faith as was given to the apostles by Jesus Christ. These deviations from orthodoxy have traditionally been called heresy, but due to the term's immediately pejorative connotations, some prefer the more technical designation of the term heterodoxy. The various autocephalous and autonomous synods of the Eastern Orthodox Church are distinct in terms of administration and local culture, but for the most part exist in full communion with one another. The Russian Orthodox Church Outside Russia (ROCOR) has recently united with the Moscow Patriarchate (MP); these two branches of the Russian Orthodox Church had separated from each other in the 1920s due to the subjection of the latter to the hostile Soviet regime (see Act of Canonical Communion). Tensions exist in the philosophical differences between those who use the Revised Julian Calendar ("New Calendarists") for calculating the feasts of the ecclesiastical year and those who continue to use the traditional Julian Calendar ("Old Calendarists"). The calendar question reflects the dispute between those who wish to synchronize with the modern Gregorian calendar, which its opponents consider unnecessary and damaging to continuity, and those who wish to maintain the traditional ecclesiastical calendar (which happens to be based on the Julian calendar), emphasizing that such a major change in the tradition of the Church may only occur through the convening of an Ecumenical council. The dispute has led to much acrimony, and sometimes even to violence. Following canonical precepts, some adherents of the Old Calendar have chosen to abstain from clerical intercommunion with those synods which have embraced the New Calendar until the conflict is resolved. The monastic communities on Mount Athos have provided the strongest opposition to the New Calendar, and to modernism in general, while still maintaining communion with their mother church. Some latent discontent between different national churches exists also in part due to different approach towards ecumenism. While the Ecumenical Patriarch of Constantinople, the Eastern Orthodox bishops in North America gathered into the Standing Conference of the Canonical Orthodox Bishops in the Americas (SCOBA), Romanian bishops, and others are fairly open to dialog with the Roman Catholic Church, both conservative and moderate Old Calendarists, many of the monks of Mount Athos, several bishops of Russian, Serbian, and some of Greek and Bulgarian churches regard ecumenism as compromising essential doctrinal stands in order to accommodate other Christians, and object to the emphasis on dialogue leading to inter-communion; believing instead that Orthodox must speak the truth with love, in the hope of leading to the eventual conversion to Eastern Orthodoxy of heterodox Christians. Proponents of ecumenism are currently engaged in discussing key theological differences such as the Filioque, Papal primacy, and a possible agreement on rapprochement and eventually full communion with the Roman Catholic and Anglican Churches. The Eastern Orthodox Church is a communion of 14 autocephalous (that is, administratively completely independent) local churches plus the Orthodox Church in America which is recognized as autocephalous only by the Russian, Bulgarian, Georgian, Polish, and Czech-Slovak Churches. Each has defined geographical boundaries of its jurisdiction and is ruled by its Council of Bishops or Synod presided by a senior bishop – its Primate (or First Hierarch). The Primate may carry the honorary title of Patriarch, Metropolitan (in the Slavic tradition) or Archbishop (in the Greek tradition). Each local church consists of constituent eparchies (or, dioceses) ruled by a bishop. Some churches have given an eparchy or group of eparchies varying degrees of autonomy (self-government). Such autonomous churches maintain varying levels of dependence on their mother church, usually defined in a Tomos or other document of autonomy. Note, that the Russian Church recognized a different order of seniority, in which the Georgian church comes after the Church of Russia and the Albanian Church – after the Church of Greece. The following is list of some of the organizations that use the term "Orthodox" in their name but do not maintain communion with any of the 14 (15) autocephalous churches and thus are not typically considered part of the Eastern Orthodox Christian communion. Orthodox Church of Greece (Holy Synod in Resistance) , so-called "Cyprianites"
Episcopi vagantes are entities that have carried out episcopal consecrations outside of the norms of canon law or whose bishops have been excommunicated by one of the 14 (15) autocephalous churches. ↑ The Orthodox Church considers itself to be both orthodox and catholic. In earlier and patristic usage, the Church usually referred to herself as the "Catholic Church" whose faith was the "Orthodox faith". Such usage is still reflected today in the Orthodox liturgy, e.g. "unite them to your Holy, Catholic and Apostolic Church" (from the litany of the catechumens, Liturgy of St. John Chrysostom). Current convention however, favors the name "Orthodox Church", perhaps partly to avoid confusion with the Roman Catholic Church, especially its Eastern rites. But, especially in official contexts, the Orthodox Church continues to use the title "Catholic Church", and Orthodox authorities such as Saint Raphael of Brooklyn have asserted that the full name of the church includes the term "Catholic" as in "Holy Orthodox Catholic Apostolic Church". The Church is referred to as the "Orthodox Catholic Church" in official church documents and some books. ↑ The appellation "Eastern" is often applied by those in the Western world to differentiate the "Western Church" which originated from the portion of the church in communion with the Bishop of Rome from the "Eastern Churches", most of which are in communion with the Patriarch of Constantinople. Members of the Orthodox Church rarely use the term "Eastern" to refer to themselves, usually simply calling themselves Orthodox or specifying the national church to which they belong (e.g. the Russian Orthodox Church). ↑ "Ecumenical Patriarch of the Worldwide Orthodox Christian Church Meets with American Bible Society Leaders". Religious News Service. July17, 2007. http://www.religionnews.com/press02/PR071707.html. ↑ "American Bible Society Sees Potential in Blossoming Greek Orthodox Relations". The Christian Post. July23, 2007. http://www.christianpost.com/article/20070723/28575_American_Bible_Society_Sees_Potential_in_Blossoming_Greek_Orthodox_Relations.htm. ↑ "RUSSIAN PUBLIC OPINION RESEARCH CENTER (IN RUSSIAN)". http://wciom.ru/novosti/press-vypuski/press-vypusk/single/8954.html. Retrieved 2007-11-10. ↑ Jay Diamond, Larry. Plattner, Marc F. and Costopoulos, Philip J. World Religions and Democracy. 2005, page 119. (also in PDF file, p49), saying "Not only do Protestants presently constitute 13 percent of the world’s population—about 800 million people—but since 1900 Protestantism has spread rapidly in Africa, Asia, and Latin America." "Canon of the New Testament". Catholic Encyclopedia. New York: Robert Appleton Company. 1913. http://en.wikisource.org/wiki/Catholic_Encyclopedia_(1913)/Canon_of_the_New_Testament. ↑ The Longer Catechism of The Orthodox, Catholic, Eastern Church, an Eastern Orthodox catechism from 1830, by Metropolitan Philaret. Start with item 366 or 372. ↑ The Longer Catechism, Item 377. ↑ Athanasius of Alexandria, On the Incarnation of the Word, §54. ↑ Mgr. Athenagoras Peckstadt, Bishop of Sinope (2005-05-18). "Marriage, Divorce and Remarriage in the Orthodox Church: Economia and Pastoral Guidance". The Orthodox research Institute. http://www.orthodoxresearchinstitute.org/articles/liturgics/athenagoras_remarriage.htm. Retrieved 2008-11-19. ↑ "A Perspective on Divorce Among Greek Orthodox Couples.". http://www.helleniccomserve.com/divorceperspective.html. Retrieved 2008-02-12. quote|One cannot arrive at a divorce rate [for Orthodox faithful] from the Archdiocesan published statistics because they ... do not track the number of civil divorces. ↑ Karras, Valerie A. (June 2004). "Female Deacons in the Byzantine Church". Church History 73 (2): 272–316. ISSN 0009-6407. ↑ A. Avenarius. Christianity in 9th-century Rus. // Beitruge zur byzantinischen Geschichte im 9.-11. Jahrhundert. Prague: V. Vavrinek, 1978. Pp. 301–315. ↑ Michael B. Petrovich; Joel Halpern (1980). "Serbs". in Stephan Thernstrom, Ann Orlov, and Oscar Handlin. Harvard Encyclopedia of American Ethnic Groups (2nd ed.). Harvard University Press. p. 925. ISBN 9780674375123. ↑ Columbia Encyclopedia, Sixth Edition. 2001–05, s.v. "Cyril and Methodius, Saints"
↑ http://www.orthodoxytoday.org/articles4/CarlsonUnity.php "Continuing the dialogue of Love: Orthodox-Catholic relations in 2004"
↑ President of Lithuania: Prisoner of the Gulag a Biography of Aleksandras Stulginskis by Afonsas Eidintas Genocide and Research Center of Lithuania ISBN 998675741X / 9789986757412 / 9986–757–41-X pg 23 "As early as August 1920 Lenin wrote to E. M. Skliansky, President of the Revolutionary War Soviet: "We are surrounded by the greens (we pack it to them), we will move only about 10–20 versty and we will choke by hand the bourgeoisie, the clergy and the landowners. There will be an award of 100,000 rubles for each one hanged." He was speaking about the future actions in the countries neighboring Russia. ↑ Sullivan, Patricia. Anti-Communist Priest Gheorghe Calciu-Dumitreasa, The Washington Post, November 26, 2006. Page C09. Accessed May 9, 2008. ↑ 86.0 86.1 Ostling, Richard. "Cross meets Kremlin", TIME Magazine, June 24, 2001. Accessed April 7, 2008. Some or all of this article is forked from Wikipedia. The original article was at Orthodox Church. The list of authors can be seen in the page history.